VANCOUVER, March 2, 2017 /CNW/ - Hannan Metals Limited ("Hannan" or the "Company") (TSX.V: HAN) is pleased to provide an exploration update and an outline of upcoming work programs for the Company's zinc projects in Ireland. Following Hannan's recent listing on the TSX Venture Exchange ("TSXV"), and the closing of a C$1.5 million financing, the Company is well positioned to commence exploration. The Company's flagship project, Kilbricken, is drilled over more than 1.5 kilometres of strike length with better drill intersections including DH46: 20.5m @ 7.5% Zn, 9.9% Pb, 74.6g/t Ag; and DH06: 21.3m @ 11.0% Zn, 4.8% Pb, 94.4g/t Ag. The Kilbricken area provides excellent potential for new discoveries, as it lies upon a 40-kilometre long structural trend 100% owned by Hannan, that includes the Milltown prospect, where drilling results included DH19: 13.3m @ 10.5% Zn, 5.8% Pb. Mr Hudson, CEO and Chairman states, "Although Hannan only listed on the TSXV last month, we have hit the ground running with our first diamond drill program planned to commence during April. Hannan owns one of the few high-grade, zinc-rich, massive sulphide discoveries made over the last decade, with the advantage of being in Ireland, one of the world's premier exploration and mining zinc terrains. Our challenge is now to expand on the very strong start we have been afforded and we look forward to building a sustainable business in Ireland by defining a large and long-life asset at Kilbricken. The Hannan team has been busy compiling and interpreting the tens of millions of dollars of proprietary data we purchased with the project, placing us in an excellent position to identify new drill targets to extend the known mineralized zone." Diamond drilling from April 2017 at Kilbricken, with permitting for that program now underway. 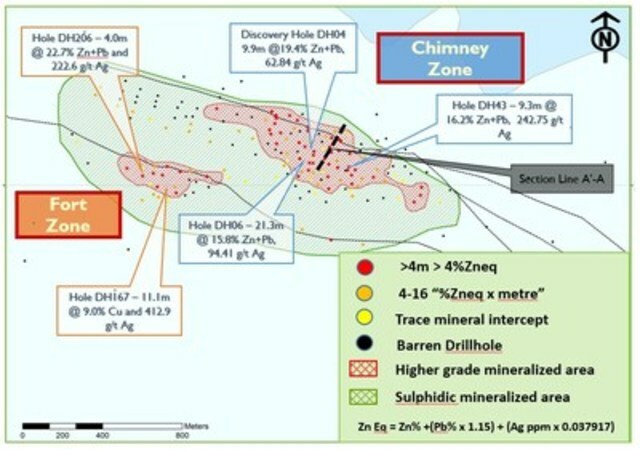 The early part of the program (3 holes for 1,500m) will focus on extracting metallurgical samples and expanding the footprint of the known mineralization beyond the current 1,500 metres strike length (Figure 1). The second stage of the drill program (10 holes for 5,000m) will test semi-regional targets within 1 to 2 kilometres from the Kilbricken project. The third stage will focus on testing regional structural targets that may host additional mineralized bodies. Delivery of an initial resource and accompanying NI43-101 report for the Kilbricken project by independent resource evaluation geologists. This work is ongoing and planned for completion during Q2 2017. A gap analysis of prior mineralogical and metallurgical test work and plan for future metallurgical studies. Dr Kurt Forrester will lead this study and has been appointed as Process Development Advisor. Dr Forrester is a Chartered Chemical Engineer (CEng MIChemE) and Chartered Professional Metallurgist (MAusIMM CP (Metallurgy)). Other field based activities including soil sampling, paleo-dating and field mapping. Later in 2017, the Company plans to collect additional 2D seismic data, commencing with a 25 kilometre regional line across the Company's 32,223 hectare prospecting licences followed by infill 2D seismic lines along the Kilbricken structural trend. Since acquiring the project in September 2016, Hannan has focussed on advancing the technical understanding of the Kilbricken project to develop a rigorous geological model to guide future exploration. The Company has engaged a specialist group of geological experts in rift tectonics, structural geology of Irish Zn-Pb deposits and local geology of the project area to re-interpret the structural controls on mineralization at Kilbricken, and the regional structures that controlled development of the Clare rift basin and subsequent Zn-Pb mineralization. In addition, 28-line kilometres of 2D seismic and four square kilometres of 3D seismic data have been re-processed; three airborne magnetic data surveys have been "de-cultured" and had spectral depth filtering applied; gravity data has been reprocessed; and >30,000 soil samples have been re-levelled and combined with geophysical data to define drill targets. Hannan has also commenced a formal technical collaboration with iCRAG at the University College Dublin, an EU and industry funded research centre with experts in Irish mineral deposits. A NI 43-101 Technical Report for the Clare Project, dated December 23, 2016, is available on the Company's profile on SEDAR at www.sedar.com or directly from the Company's website. The Technical Report was authored by Dr. John Colthurst, PGeo, EurGeol, who is an independent "qualified person" as defined by National Instrument 43-101. Certain information set forth in this news release contains "forward-looking statements" and "forward- looking information" under applicable securities laws. Except for statements of historical fact, certain information contained herein constitutes forward-looking statements, which include the Company's expectations regarding future performance based on current results, expected cash costs based on the Company's current internal expectations, estimates, projections, assumptions and beliefs, which may prove to be incorrect. These statements are not guarantees of future performance and undue reliance should not be placed on them. Such forward-looking statements necessarily involve known and unknown risks and uncertainties, which may cause the Company's actual performance and financial results in future periods to differ materially from any projects of future performance or results expressed or implied by such forward-looking statement. These risks and uncertainties include, but are not limited to, timing of permitting, commencement and successful completion of planned drill programs, timing of delivery of an initial resource calculation, liabilities inherent in mine development and production, geological risks, the financial markets generally, and the ability of the Company to raise additional capital to fund future operations. There can be no assurance that forward-looking statements will prove to be accurate, and actual results and future events could differ materially from those anticipated in such statements. The Company undertakes no obligation to update forward-looking statements if circumstances or management's estimates or opinions should change except as required by applicable securities laws. The reader is cautioned not to place undue reliance on forward-looking statements.